Charles V the Wise (French: Charles V le Sage) (January 31, 1338 – September 16, 1380) was king of France from 1364 to 1380 and a member of the Valois Dynasty. His reign marked a high point for France during the Hundred Years' War, with his armies recovering much of the territory ceded to England at the Treaty of Bretigny. Unfortunately, his successors were unable to maintain the unity that was needed to preserve France's territorial integrity and by 1419, the country was divided between Armagnac and Burgundian factions and Henry V of England was conquering the northern part of France. The hard-won victories of Charles V were soon lost through the venality of his heirs. Charles was born at Vincennes, Île-de-France, France, the son of King Jean II and Bonne of Luxembourg. Upon his father's succession to the throne in 1350, Charles became Dauphin. He was the first French heir to use the title, after the region of Dauphiné was acquired by his father. The future king was highly intelligent but physically weak, with pale skin and a thin, ill-proportioned body. He made a sharp contrast to his father—who was tall, strong and sandy-haired—and gossip at the time suggested he was not Jean's son. 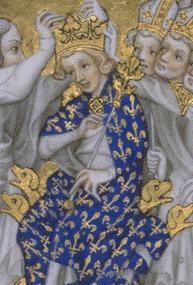 Similar rumors would pursue Charles's grandson, Charles VII. King Jean was a brave warrior but a poor ruler who alienated his nobles through arbitrary justice and the elevation of associates considered unworthy. After a three-year break, the war resumed in 1355, with Edward, The Black Prince, leading an English-Gascon army in a violent raid across southwestern France. After checking an English incursion into Normandy, Jean led an army of about sixteen thousand soldiers south, crossing the Loire in September 1356, attempting to outflank the Prince's eight thousand soldiers at Poitiers. Rejecting advice from one captain to surround and starve the Prince—a tactic Edward feared—Jean ordered a charge up a slope where the enemy forces were entrenched. In the subsequent Battle of Maupertuis (Poitiers), English archery all but annihilated the French cavalry, and Jean was captured. Charles led a battalion at Poitiers which withdrew early in the struggle; whether the order came from Jean (as he later claimed) or whether Charles himself ordered the withdrawal is unclear. The outcome of the battle left many embittered at the nobility, who, in popular opinion betrayed the king. However, Charles and his brothers escaped blame, and Charles was received with honor upon his return to Paris. The Dauphin summoned the Estates-General in October to seek money for the defense of the country. But the parliament, furious at what they saw as poor management, organized themselves into a body led by Etienne Marcel, the Provost of Merchants (a title roughly equivalent to mayor of Paris today). Marcel demanded the dismissal of seven royal ministers, their replacement by a Council of 28, made of nobles, clergy, and bourgeois, and the release of Charles II of Navarre, a leading Norman noble with a claim on the French throne who had been imprisoned by Jean for the murder of his constable. The Dauphin refused the demands, ordered the Estates-General to dismiss and left Paris. A contest of wills followed. In an attempt to raise money, Charles tried to devalue to the currency; Marcel ordered strikes, and the Dauphin was forced to cancel his plans and recall the Estates in February 1357. The Third Estate presented the Dauphin with a Grand Ordinance, a list of 61 articles that would have required the Estates-General to approve all future taxes, assemble at their own volition and elect a Council of 36—with 12 members from each Estate—to advise the king. Charles eventually signed the ordinance, but his dismissed councilors took news of the document to King Jean, imprisoned in Bordeaux. The king renounced the entire ordinance before being taken to England by Prince Edward. Charles made a royal progress through the country that summer, winning support from the provinces. Marcel, meanwhile, enlisted Charles of Navarre, who believed his claim to the throne of France was at least as good as that of King Edward of England's. The Dauphin, re-entering Paris, won the city back. Marcel, meanwhile, used the murder of a citizen seeking sanctuary to make an attack close to the Dauphin. Summoning a group of tradesmen, the Provost marched at the head of an army of three thousand, entered the royal palace, and had the crowd murder two of the Dauphin's marshals before his eyes. Charles, horrified, momentarily pacified the crowd, but sent his family away and got out the capital as quickly as he could. Marcel's action destroyed the Third Estate's support among the nobles, and the Provost's subsequent support for the Jacquerie undermined his support from the towns; he was murdered by a mob on July 31, 1358. Charles was able to recover Paris the following month; he later issued a general amnesty for all, except close associates of Marcel. Jean's capture gave the English the edge in peace negotiations. The king signed a treaty in 1359 that would have ceded most of western France to England and imposed a ruinous ransom of 4 million ecus on the country. The Dauphin (backed by his councilors and the Estates-General) rejected the treaty, and King Edward used this as an excuse to invade France later that year. Edward reached Reims in December and Paris in March, but Charles, relying on improved municipal defenses, forbade his soldiers from direct confrontation with the English. Charles relied on improved fortifications made to Paris by Marcel, and would later rebuild the Left Bank wall and built a new wall on the Right Bank that extended to a new fortification called the Bastille. Edward pillaged and raided the countryside but could not bring the French to a decisive battle, and eventually agreed to reduce his terms. This non-confrontational strategy would prove extremely beneficial to France during Charles's reign. The Treaty of Bretigny, signed on May 8, 1360, ceded a third of western France—mostly in Aquitaine and Gascony—to the English, and lowered the king's ransom to 3 million ecus. Jean was released the following October. Though his father had regained his freedom, Charles suffered a personal tragedy. His three-year-old daughter, Jeanne, and his infant daughter Bonne died within two weeks of each other; the Dauphin was said at their double funeral to be "so sorrowful as never before he had been." Charles himself had been severely ill, with his hair and nails falling out; some suggest these symptoms suggest arsenic poisoning. Jean proved as ineffective at ruling upon his return to France as he had before his capture. When a French noble sent to England as a hostage left the country without permission, Jean announced he had no choice but to return to captivity himself in the man’s place—an action that, despite the cult of chivalry, seemed extreme to fourteenth century minds. Jean arrived in London in January 1364, became ill, and died the following April. 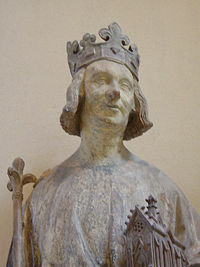 Charles was crowned King of France in 1364 at the cathedral at Reims, France. The new king was highly intelligent but close-mouthed and secretive, with sharp eyes, a long nose, and a pale, grave manner. He suffered from gout in the right hand and an abscess in his left arm, possibly a side-effect of an attempted poisoning in 1359. Doctors were able to treat the wound but told him that if it ever dried up, he would die within 15 days. "Not surprisingly," said historian Barbara Tuchman, "the king lived under a sense of urgency." His manner may have concealed a more emotional side; his marriage to Jeanne de Bourbon was considered very strong, and he made no attempt to hide his grief at her funeral or those of his children, six of whom predeceased him. His reign was dominated by the war with the English, recovering the territories ceded at Bretigny, and ridding the land of the Tard-Venus (French for "latecomers"), mercenary companies that turned to robbery and pillage after the treaty was signed. In achieving these aims, Charles turned to a minor noble from Brittany named Bertrand du Guesclin. Referred to as a "hog in armor," du Guesclin had fought in that province's bitter civil wars, and learned to fight guerrilla warfare. Du Guesclin defeated Charles II of Navarre in Normandy in 1364 and eliminated the noble's threat to Paris; he was captured in battle in Brittany the following year but quickly ransomed. To attempt to rid the land of the Tard-Venus, Charles first hired them for an attempted crusade into Hungary, but their reputation for brigandage preceded them, and the citizens of Strasbourg refused to let them cross the Rhine on their journey. Charles next sent the mercenary companies (under the leadership of Du Guesclin) to fight in a civil war in Castile between Pedro the Cruel and his brother, Don Enrique of Trastamare. Pedro had English backing, while Enrique was supported by the French. Du Guesclin and his men were able to drive Pedro out of Castile in 1365, but The Black Prince, now serving as his father's viceroy in southwestern France, took up Pedro's cause. At the Battle of Najera in April 1367, the English defeated Du Guesclin's army and took the Breton prisoner a second time. Despite the defeat, the campaign had destroyed several companies of Tard-Venus and given France a temporary respite from their depredations. The Black Prince's rule in Gascony became increasingly autocratic, and when Pedro defaulted on his debts after Najera, the Prince taxed his subjects in Guienne to make up the difference. Nobles from Gascony petitioned Charles for aid, and when the Black Prince refused to answer a summons to Paris to answer the charges, Charles declared him disloyal and declared war in May 1369. Legally, Charles had no right to do this—the French had given up sovereignty over Gascony under the Treaty of Bretigny—but the king ignored this. Instead of seeking a major battle, as his predecessors had done, Charles chose a strategy of attrition, spreading the fighting at every point possible. The French were aided by the navy of Castile (Du Guesclin had captured Pedro the Cruel by deceit in 1369 and turned him over to Enrique, who promptly killed his brother with a dagger) and the declining health of the Black Prince who developed dropsy and quickly became an invalid. Where Charles could, he negotiated with towns and cities to bring them back into the French fold. Du Guesclin, appointed Constable of France in 1370, beat back a major English offensive in northern France with a combination of hit-and-run raids and bribery. The English were crippled by the loss of major leaders and their own tendency to raid the countryside instead of embarking on major offenses. By 1374, Charles had recovered all of France except Calais and Aquitaine, effectively nullifying the Treaty of Bretigny. Peace, however, remained elusive; treaty negotiations began in 1374 but were never able to bring about more than extended truces, owing to Charles's determination to have the English recognize his sovereignty over their lands. In 1376, Pope Gregory XI, fearing a loss of the Papal States, decided to move his court back to Rome after nearly 70 years in Avignon. Charles, hoping to maintain French influence over the papacy, tried to persuade Pope Gregory XI to remain in France, arguing that "Rome is wherever the Pope happens to be." Gregory refused. The Pope died in March 1378. When cardinals gathered to elect a successor, a Roman mob, concerned that the predominantly French College of Cardinals would elect a French pope who would bring the papacy back to Avignon, surrounded the Vatican and demanded the election of a Roman. On April 9, the cardinals elected Bartolomeo Prigamo, Archbishop of Bari and a commoner by birth, as Pope Urban VI. The new pope quickly alienated his cardinals by criticizing their vices, limiting the areas where they could receive income and even rising to strike one cardinal before a second restrained him. The French cardinals left Rome that summer and declared Urban's election invalid because of mob intimidation (a reason that had not been cited at the time of the election) and elected Cardinal Robert of Geneva as Pope Clement VII that September. The French cardinals quickly moved to get Charles's support. The theology faculty of the University of Paris advised Charles not to make a hasty decision, but he recognized Clement as Pope in November and forbade any obedience to Urban. Charles's support allowed Clement to survive—he would not have been able to maintain his position without the aid of the king—and led to the Papal Schism, which would divide Europe for nearly 40 years. Historians have severely criticized Charles for allowing the division to take place. Charles's last years were spent in the consolidation of Normandy (and the neutralization of Charles of Navarre). Peace negotiations with the English continued unsuccessfully. The taxes he had levied to support his wars against the English had caused deep disaffection among the working classes. The abscess on the king's left arm dried up in early September 1380, and Charles prepared to die. On his deathbed, perhaps fearful for his soul, Charles announced the abolition of the hearth tax, the foundation of the government's finances. The ordinance would have been impossible to carry out, but its terms were known, and the government's refusal to reduce any of the other taxes on the people sparked the Maillotin revolt in 1381. The king died on September 16, 1380, and was succeeded by his 12-year-old son, Charles VI. While he was in many ways a typical medieval king, Charles V has been praised by historians for his willingness to ignore the chivalric conventions of the time to achieve his aims, which led to the recovery of the territories lost at Bretigny. His successes, however, proved short-lived. Charles's brothers, who dominated the regency council that ruled in King Charles VI’s name until 1388, quarreled amongst themselves and divided the government. Charles VI, meanwhile, preferred tournaments to the duties of kingship, and his descent into madness in 1392 put his uncles back in power. By 1419, the country was divided between Armagnac and Burgundian factions and Henry V was conquering the northern part of France. The hard-won victories of Charles V had been lost through the corruption of his successors. History of "Charles V of France"
This page was last modified on 8 May 2013, at 14:23.